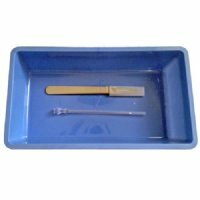 1 MRI "Non-Ferro Magnetic" Needle 20g 9cm - This needle is completely safe for use as a puncture or injection needle. Important note: These products are intended for use inside of the MRI environment (in the MR system room). They should not be utilized directly inside of the MR system (inside the bore of the scanner) during its operation (scanning). As such, the assessment of magnetic field interactions for this product specifically involved evaluations of translational attraction and torque in relation to exposure to a 3-Tesla MR system. This product has not been tested for MRI-related heating and artifacts.